Rose bushes are found in landscapes all over the world because of their renowned beauty, their intoxicating scent, and their longevity as cut flowers. Their blooms come in a range of colors offering plenty of variety for homeowners to choose from. Modern rose bushes are also hardier than ever making plants flourish in a wide range of growing conditions with only a little TLC. Most rose bushes sold are known as "grafted" roses -- the top part is one type of rose that has been grafted onto the rootstock of a hardier variety. 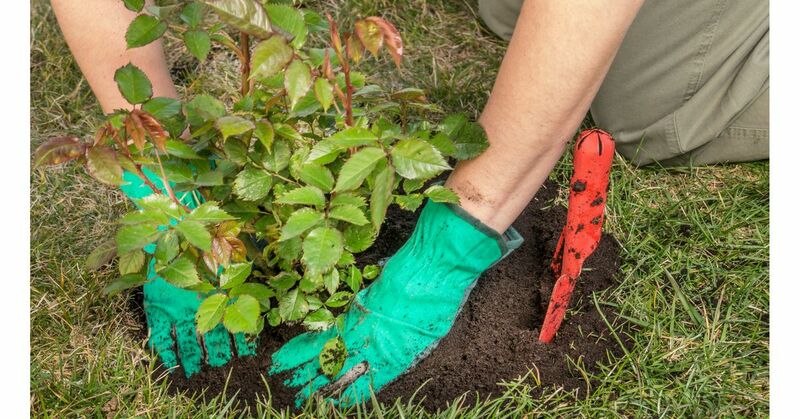 To keep the graft protected from weather, it's important you dig the planting hole deep enough that the graft on your rose bush is planted at the correct depth. In cold climate areas the graft should be planted at least 2-3" below the soil surface; in warmer areas with milder winters plant the graft at the soil level. You can learn more about grafted roses over at Gardening Know How.